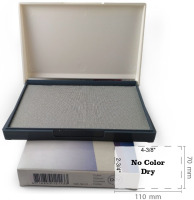 Felt Stamp Pad #00, Size 1-3/4" x 3-1/2"
Standard felt stamp pad delivers clear, quality impressions. Design provides the cushion of foam with the long-lasting quality of felt. 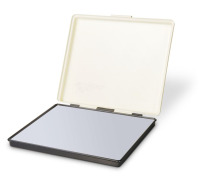 Delivers clear, quality impressions. Approximately 15,000 impressions before re-inking. S-1F Shiny Size 00 Felt Stamp Pad, 1-3/4"x2-1/2"
Available colors; Black, Blue, Green, Red, Violet and Dry. S-2F Shiny Size #0 Felt Stamp Pad, 2-1/4"x3-1/4"
S-3F Shiny No. 1 Felt Stamp Pad, 2-3/4"x4-3/8"
S-4F Shiny No. 3 Felt Stamp Pad, 5"x7"
S-5F Shiny No. 2 Felt Stamp Pad 3-1/16"x6-1/8"
3F Shiny Industrial Felt Stamp Pad, 2-3/4"x4-3/8"
Heavy Duty Industrial Plastic Case. 4F Shiny Industrial Felt Stamp Pad 5"x7"
Shiny MP-1F Industrial Felt Stamp Pad, 7-1/16"x8-1/4"
Heavy Duty Industrial Metal Case. Shiny MP-3F Industrial Felt Stamp Pad, 7-7/8"x11-3/4"